Ollie often asks to read about butterflies and so today I thought it would be fun to do a butterfly themed activity. 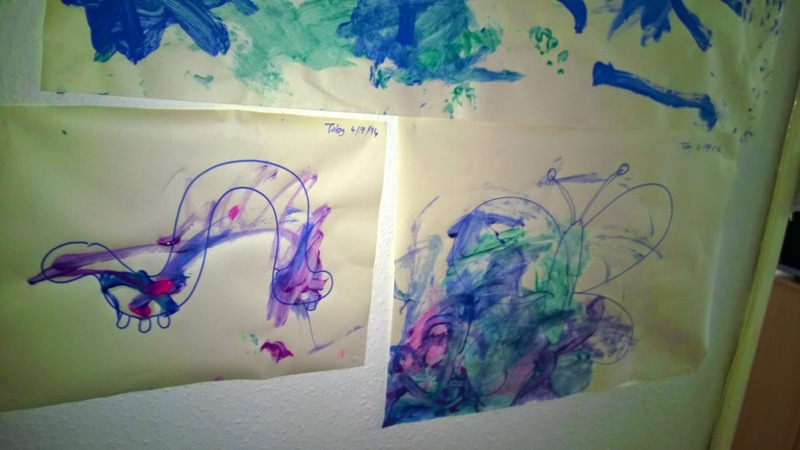 Toby loves to paint so I set up an activity that both boys would enjoy. The first step was to colour large pictures of butterflies that I drew for them. It's great to let kids be totally free with their art work a lot of the time, but in this case I had a specific outcome in mind so pre-drawing the images was helpful to the pace of the activity. 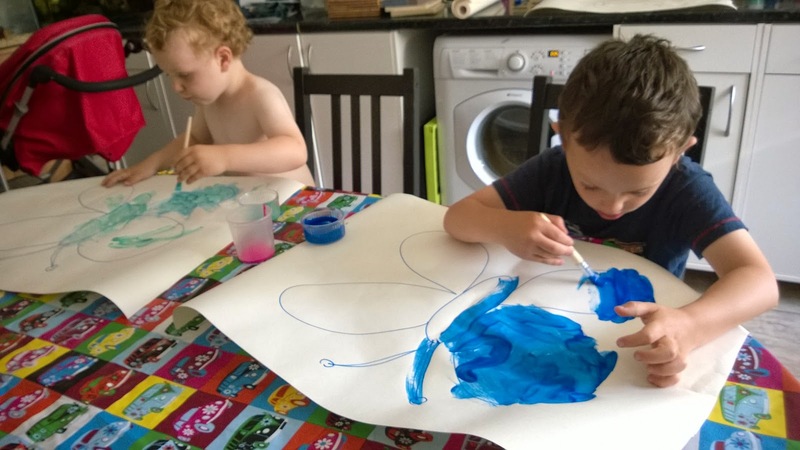 Toby chose to paint his butterfly in green and pink, Ollie chose to do a fold print and painted half of his butterfly in blue. He folded it to make the print, then decided it wasn't filled in enough and painted over the other half too, finishing by printing pink spots on it. I retrieved his picture to set to one side to dry at that point because Ollie doesn't have an 'enough paint' moment and will just keep adding until he ends up with a mushy bit of paper mache. We then painted in outlines of caterpillars, cocoons and eggs on a leaf that I had drawn on separate pieces of paper. Ollie chose to do some leaf printing around his caterpillar for it to eat. Interestingly Toby painted on his caterpillar inside the lines for the most part - not something that Ollie was doing at two. 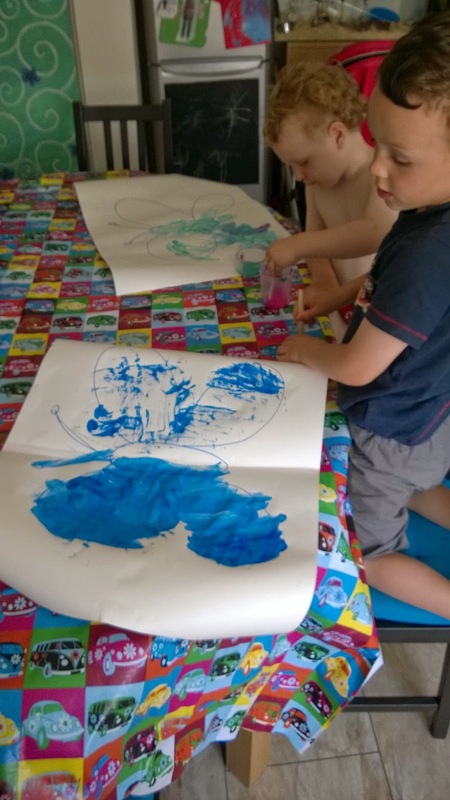 This is a great activity for working on communication - "what is that you are painting Toby? What colours are you using? Is it a big butterfly or a small butterfly?... I like the way you are making spots with your brush, would you like a different colour?... " After painting two pictures Toby then wandered off to wash his hands and play with his trains. Our next step was to label Ollie's pictures. 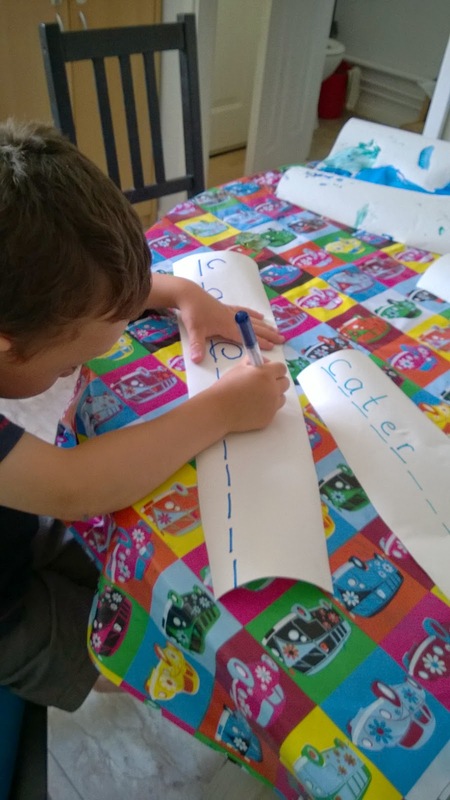 It can be frustrating to Ollie if he makes a mistake writing on a picture he's spent a long time on, so I cut rectangles of paper to write on which he could glue on if he was happy with them. 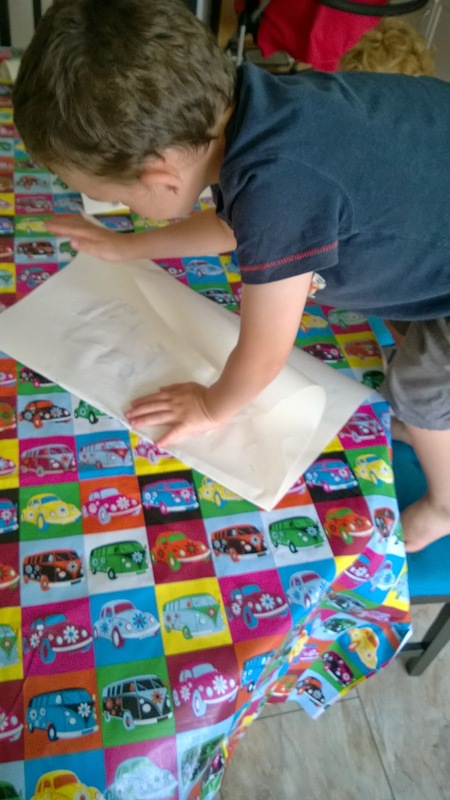 I don't tell him to re-do writing if he is with it, the point of the activity is to be creative and explore how we can use writing to communicate our science ideas, not to produce something 'perfect' by repetition and in so doing squash the fun out of it. I drew lines on the paper to guide where each letter could go - simply to make sure there was space for the whole word as without them we end up with C............aterpllr. I then asked what Ollie thought the word caterpillar started with - he said 'c' like 'cat' then had this lightbulb moment when he realised that 'caterpillar' had 'cat' in it - a word he already knew how to spell. I wrote the letters out on my own piece of paper so he could remind himself of how to write them and see the rest of the word written letter by letter. He likes to write 'T' instead of 't' and at this point all I do is show him how I write a 't' in the middle of a word and then praise him for his concentration on writing neatly. Praising the things they get right, or nearly right, builds them up and makes them want to continue. Say 'that's wrong' and they will be afraid to do anything in case they make a mistake. 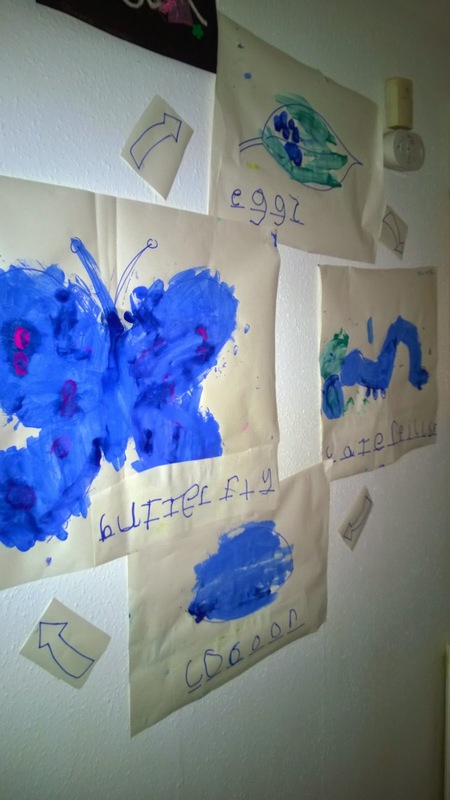 Ollie wanted to label up his other pictures, so we followed the same procedure for 'butterfly' (another big laugh when he realised he had written 'butter' - "it's butter! Like we eat butter!". Toby noticed we were gluing at this point and rejoined us to glue scraps of paper together, enough of a distraction that Ollie wrote 'Cocoon' with more 'o's than is strictly necessary and 'eggs' with a sort of a 'z'. Again, praise 'hey, that's almost like mine, well done for trying to concentrate when Toby is making that great sticky picture'. After it was all done and his labels were stuck on (a couple upside down to start with, but gently peeled off and reattached right way up) we talked about what order to put the pictures in, and how we couldn't just do them as a line because each led to the next stage round and round as a cycle. I bluetacked them up on the wall with arrows to show the direction of the cycle, plus Toby's beautiful paintings so that he was part of our gallery too. When Matt came home from work the boys pounced on him to 'come and see what we have done in the corridor' and excitedly showed off their work to him. Later on we went for a caterpillar hunt in the garden. The first ones we found were teeny tiny newly hatched moth caterpillars on our tomato plant - Toby held the leaf gently and kept repeating 'me caparpillars' while studying them intently, so I found a plastic vivarium to put them in so he could watch them for a bit longer. Then we found a Large White caterpillar munching on our nasturtiums and Toby again said 'me caperpillar - me BIG caperpillar!' so we evicted the moth caterpillars down to the end of the garden and replaced them with the big caterpillar and a supply of leaves. Toby has decided to name it 'Ra Ra the caperpillar' so I guess caterpillar is going to stay with us for a while, giving us the chance to watch it change first hand. I'm conscious of it's welfare, but it has already fared rather better than the other caterpillars I find on our plants which get gently but firmly moved on to a patch of weeds near our house and which I suspect the birds make short work of despite my efforts to treat them humanely. With due care and a bit of luck the boys should be able to see much of the cycle they painted happening for real in front of their eyes over the next few weeks. This activity is useful for the following learning and development areas (amongst others): language and communication, literacy, natural history awareness - life cycles, creativity, fine motor skills, reasoning skills (the order events happen in) and feeling good by working together to produce something they are proud of.